I love recycled sari yarn. It has all the things my little hippie heart adores. It's recycled from saris, it's silk!, it's got all sorts of colors and fun texture things going on. A lot of people like it but then don't know what to do with it. It's almost too much goodness. I didn't have that problem with this skein because I ordered it knowing it was going to be bracelets and accessories. The company that sells it is Darn Good Yarn- and if you use my link, you'll get a coupon for a good savings and I'll get a credit on my next order. Win win right? Then you can refer your friends and they can get a coupon and you can get credit. Awesome loyalty program. This is the yarn I bought from them in my first order and what I plan to do with it. The 4 skeins on the right hand side are a chiffon ribbon yarn that I'll be using to make a purse. 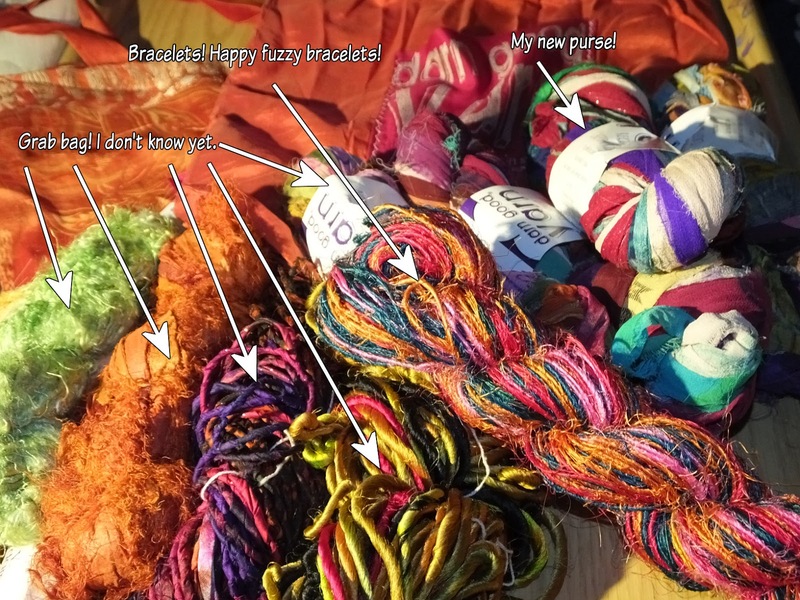 The one in the forefront is the Recycled Photon Rainbow Sport Weight Recycled Silk Yarn that I used to make the bracelet above. So the bracelet is simple enough to make. 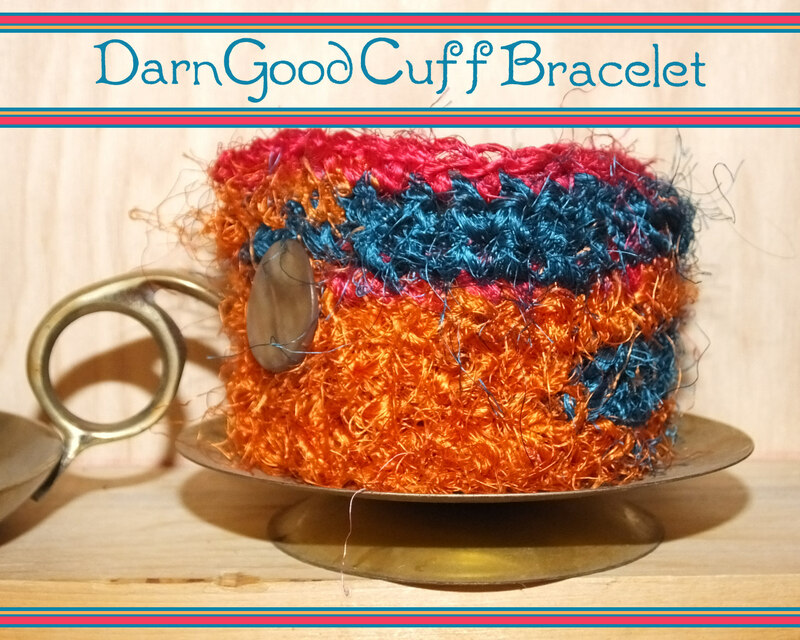 It's single crochets, chains and a pretty button. The yarn has so much going on that I wanted to simply show off the yarn. 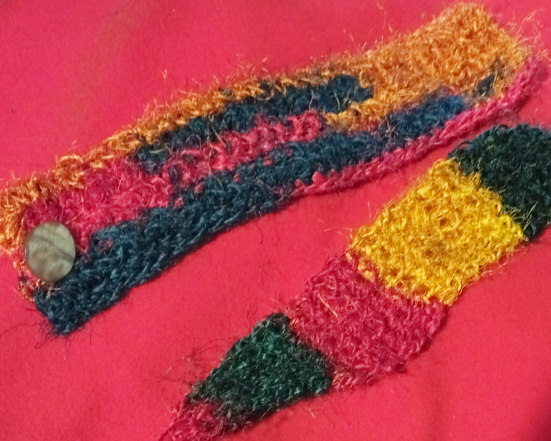 The problem is, because of the length of color changes, simply crocheting back and forth didn't work. It just made stripes instead of the sort of organic shape color changes I wanted. You can see my bracelet on top in this picture- and what it looks like working back and forth in the bottom picture. So to get the color changes, I worked in 2 directions. Weave in all ends. Stitch button on opposite side of button hole. I just used some of the yarn. The yarn is very strong, and very crisp feeling. It looks kind of like jute twine, but it's very soft to the touch with a nice amount of structure. You can gently handwash finished pieces, lay flat to dry. If you want your finished item softer, putting it in a dryer on delicate/low heat for a few minutes will soften the yarn. One skein will make a lot of small projects like this with 147 yards per skein.